Some appliances are an integral part of our daily lives. For instance, when your refrigerator stops working properly, you need to get it repaired or replaced right away. Appliances that can’t be fixed can be recycled. Identifying appliances that can be recycled in Massachusetts will help you save time and make some extra money. While you won’t make back all the money you invested into your refrigerator, you will be able to get something out of it by selling old appliances for scrap metal. 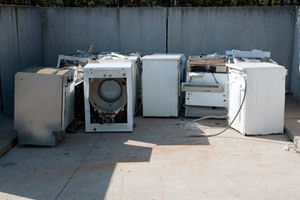 Not only will they take the useless appliance from you and dispose of it properly, but they will also pay you for the value of the scrap metal that can be recovered. You have a couple of choices when it comes to disposing of an old appliance that isn’t working properly. You can pay someone to pick it up and take care of it for you, or you can also take it to the local scrap metal salvage company. If you are unfamiliar with appliances or the metals and hazardous materials contained within, your best bet is to bring the old appliance as-is to the recycling center and get paid for it based on overall weight. The Environmental Protection Agency (EPA) requires all refrigerants from air conditioners, refrigerators and freezers to be recovered. When you bring your old appliances to the local recycling and salvage center, professional workers will recover refrigerants and any other hazardous chemicals, keeping CFCs, HCFCs, HFCs, PCBs, mercury and other harmful things out of the landfill and the atmosphere. When in doubt, get a professional to do the work. If you are familiar with appliances, you can disassemble the items using screwdrivers, sockets and wrenches, separating the ferrous materials on the outside casing of the appliances from the non-metal and non-ferrous materials on the inside. Some scrappers will even go the extra step and cut the metal pieces into 2 foot squares for easier handling before loading them in a truck for recycling. Even if you have a lot of experience working with appliances make sure that you are well-aware of any and all hazardous materials that will need to be removed before recycling. Check for any local laws that might prohibit dis-assembly of old appliances without certification. Use work gloves and safety glasses throughout this process and don’t hesitate to consult with a professional if you are uncomfortable at any point of this project. We hear about the benefits of recycling a lot today, but beyond the popular trends of “going green” and environmentalism, there are economic benefits associated with selling old appliances for scrap metal. While thinking about things like pollution, ground water and clean air are important, things like preserving our natural resources and reducing costs for industrial and manufacturing products should also be considered. Scrap metal that has been recovered and sold to local salvage facilities can be broken down, melted and made into new products that are used by various companies to make new appliances and products for consumers. The savings associated by using recycled metals compared to using new, virgin materials, is passed down to the consumer, reducing the cost of appliances and other products within the local economy. In addition to reducing costs, an increase in consumer and corporate awareness of the importance of scrap metal recycling has lead to an increase in technology and innovation in this growing field. New jobs, economic development and financial profit for those who participate in scrap metal recycling programs and efforts are just some of the other economic benefits. If you are new to scrap metal recycling or are just getting started in the Southcoast area, you might wonder how to get the best prices for scrap metal in Massachusetts. Mid-City Scrap Iron & Salvage in Westport, Massachusetts has been providing scrap metal recycling services locally for generations. There are a number of unique programs for consumers that are interested in selling old appliances for scrap metal and for corporations and manufacturers that are interested in finding new ways to use recycled scrap metal in their business. Call Mid-City Scrap Iron & Salvage toll-free at 800-334-4789 for more information about selling old appliances for scrap metal. Once you learn how scrap metal recycling works and get involved, Mid-City can help you get the best prices for scrap metal in Massachusetts.